Any Malaysian mom will know that when it comes to food, our kids (and their friends!) will travel far, far away just to eat that "awesome Nasi Lemak" or will always wait impatiently for Raya so they could sink their teeth into Rendang, Ketupat and so on. 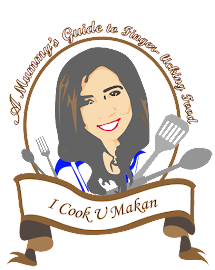 So I decided to create this blog to help anyone out there who is keen to learn various recipes and to expand their culinary skills. It has been my dream to create something like this, and thanks to the wonder of blogs, I am able to do so. I dedicate this blog to my children, Farah & Farmin who are always more than happy to eat rather than to cook. Hopefully they will be able to cook their favorite dishes without my assistance. Please feel free to comment or contribute any recipes to my blog. Always welcome with open arms.